Assists in detoxifying the body. It protects and supports liver cells and encourages liver cell regeneration. Improves fat metabolism. Improves the production and movement of bile. 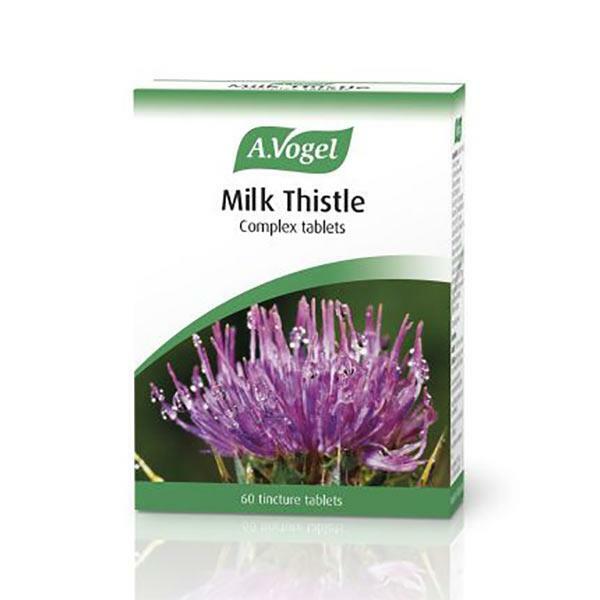 The seeds of Milk Thistle are combined with four other important herbs used in healthcare for centuries – fresh extracts of Dandelion, Artichoke, Peppermint and dried Boldo leaves. A.Vogel is based in Roggwil, Switzerland and was founded in 1963 by Alfred Vogel, the eminent Swiss Naturopath and pioneer in natural health. Bioforce AG now supplies fresh herb tinctures and tablets to over 30 countries world-wide. The majority of herbs used to produce the A.Vogel range are grown using a strict organic protocol, mainly in the fertile conditions of Roggwil. This allows the company to exert complete control over the cultivation of plants, from planting through to harvesting, using Good Agricultural and Collection Practice (GACP). A.Vogel have complete traceability of their raw material and grow their own herbs.